Joash Woodrow was one of eight sons and two daughters. His father and mother were of Polish background, marrying in Boston, USA. On moving to Leeds his father worked as a Hebrew scholar and bookseller before finally moving into the textile trade. Joash initially trained at Leeds College of Art after which he served in the army as a cartographer in Egypt (1945-8). Between 1950-3 he studied drawing and painting at the Royal College of Art, along with Frank Auerbach, Peter Blake and novelist Len Deighton. Shortly after graduating from the RCA Joash suffered from a nervous breakdown, returning to his home in Chapel Allerton, Leeds to live with his mother and brother, Israel. From this time Joash began working from home, steadily producing drawings and paintings. Following the death of his mother in 1962 and his brother in 1978, Joash became very prolific, painting increasingly large pictures. During the late 1990’s his health began to decline considerably and he was moved to sheltered accommodation in 2000. Over 700 paintings and several thousand drawings were found in his home/ studio in 2001. Late in his life Joash had become aware of the critical acclaim his work was beginning to receive and in the summer of 2005 he visited Manchester Art Gallery with his brother Saul, to view the first major retrospective exhibition of his paintings. One of ten children born to Polish-American parents, Joash Woodrow trained locally at Leeds College of Art. He served in Egypt as an army cartographer (1945–48) before studying at the Royal College of Art (1950–53) alongside Frank Auerbach and Peter Blake. 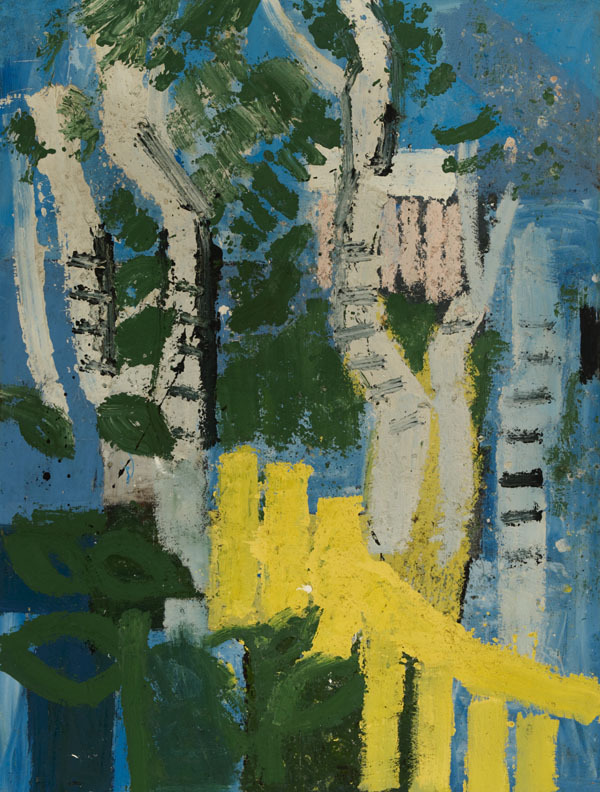 After suffering a nervous breakdown, he returned home to live with his mother (d. 1962) and brother, Israel (d. 1978), latterly painting on an increasingly large scale, and often using household paint. Following his move to sheltered accommodation in 2000, over 700 paintings and several thousand drawings were found in his studio-home. In 2005 Manchester Art Gallery mounted the first major Woodrow retrospective.